4. Slow Trunk-Twisting with Sideways Bending – Learn JP MÜLLER'S 15-Minute Full Body Workout "MY SYSTEM"
a. (1stº) A. Slow Trunk Twisting (seated): Hands on hips, twist upper body left and right, alternately inhaling and exhaling. After 5 movements, pause and hold. 5 more, with opposite inhalation/exhalation. b. (1stº) B. Sideways Bending (seated): On chair, with limp arms, bend deeply side to side, allowing hand to touch floor. 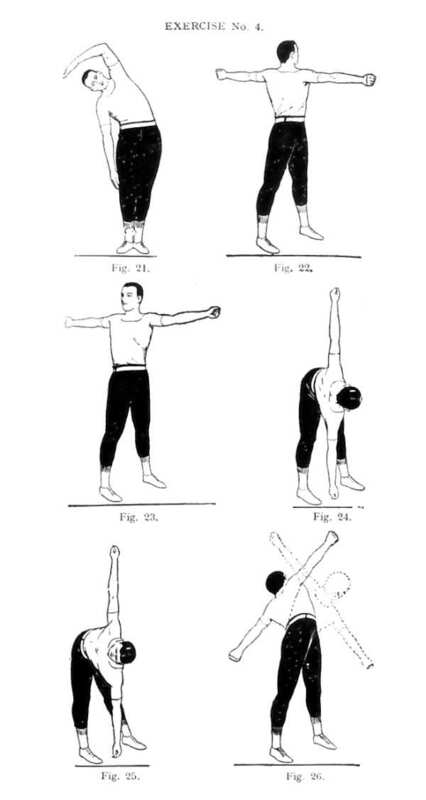 Perform 19 movements, with alternating breathing. Switch breathing half-way. c. (2ndº) A. 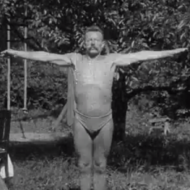 Slow Trunk Twisting (standing): Standing, spread your feet apart as far as you are able. Raise the arms to the side, and twist the upper body, taking care to keep the lower part of the body immobile. Reps and breathing as above. d. (2ndº) B. Sideways Bending (standing) Stand with heels together and perform the same movement as in the 1stº, however, when you bend to the left, use your right arm to reach up and over your head towards your left side (as if you were going over the top of your head to grab your opposite ear). This will create an extra challenge for your flank muscles (obliques). e. (3rdº) Stand with legs apart and perform the same movement as in the 2ndº part A. When you reach the end of your twist, bend downwards so that your fist touches the ground between your legs. Raise back up, reset, and repeat twisting the opposite direction and then bending down so that your other fist touches the ground. Keep all movement in the waist (not the knees). INHALE while coming back up and half way through the twist. EXHALE during the remainder of the twist and the downward bend. Perform 10 full movements during 10 full breaths. As you become more flexible, move your feet closer together. f. (4thº) Stand as in the 3rdº. Begin as if you were at the end of your downwards bend (left fist touching the ground, other arm skyward). Raise back up, turn all the way to the left. Instead of bending so that your right fist touches the ground, bend about half way and then quickly bend back up and “backwards” as far as possible (as if you were trying to make your left fist touch the ground behind you). Bend forward again so that this time, your right fist touches the ground. Perform the same movements in the opposite direction. INHALE while raising up and twisting around and EXHALE while performing the two short bends and one long bend. Perform 10 full movements over 10 full breaths.